The Iowa Fatality Assessment & Control Evaluation (FACE) Program collects basic information on all occupational fatalities in the state of Iowa. Additionally, we collect in-depth information on select fatal injuries, occasionally conducting detailed on-site investigations. We alert employers, employees, and those who are self-employed, such as farmers, making recommendations and program suggestions to help prevent similar fatalities. 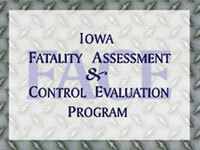 This site provides users with access to Iowa fatality investigation reports with both basic and in-depth information. The National Institute for Occupational Safety & Health's state-based FACE began in 1989. Currently, nine state health or labor departments have cooperative agreements with NIOSH for conducting surveillance, targeted investigations, and prevention activities at the state level.